How can a spill affect your community? Oil injures fish and wildlife, and may smother or destroy sensitive habitats, altering migration patterns and negatively affecting life cycles. Oil spills can also lead to beach closures and restrictions on local fisheries, severely impacting local economies. After we assess the environmental injury, we determine the best methods to restore the habitat. We undertake projects aimed at returning the environment to the condition it was in before the spill occurred. We also develop projects that improve recreational access. An oiled marsh on the coast of Louisiana following the Deepwater Horizon/BP oil spill in 2010. Oil spills—ranging from just a few gallons to millions of barrels—occur in the U.S. all too often. In fact, NOAA responds to as many as 150 oil spills each year. 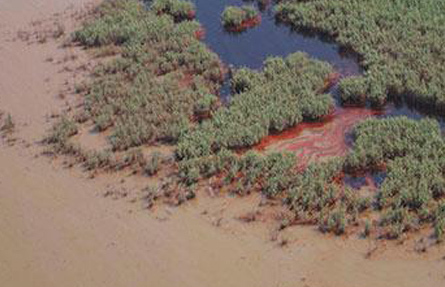 The 2010 Deepwater Horizon oil spill in the Gulf of Mexico is a recent example of the extensive environmental and economic damage an oil spill can cause.